I just uploaded the initial version of a new plugin over at lotrointerface. It's based on an idea proposed by Gloradan. This plugin helps you keep track of all those recurring tasks you need to juggle when managing several characters. It maintains a table of reminders for "to do" items, each of which has a countdown timer and an optional color-coded category. You can organize the reminders into tabs however you prefer, such as a tab for each character, or a tab for each category of task. More detailed information is available at lotrointerface. Last edited by Thurallor; Oct 16 2017 at 11:43 AM. Oh that's nice for Raid reminders and doubling up Mordor dailies. Version 1.05 of Reminders is now available at lotrointerface. Fixed a bug that sometimes prevented an existing reminder from being edited. When you hover the mouse over the icon, it now shows a list of expired reminders in the tooltip. You can now use the Enter and Escape keys in some places where you would expect them to accept a change or close a window. Added French translations and a beautiful icon that is displayed when the window is minimized. Both thanks to Gloradan. To avoid accidents, you now need to delete all the reminders under a tab before you can delete the tab. The icon will now stay visible even when the main window is open. The number displayed in the icon now represents the total number of expired reminders -- not the number that have expired since the last time you opened the window (as in the previous version). There was some problem with the site that was preventing the latest version from being downloaded. I think it's fixed now. Just updated with the Compendium. Version 1.07 of Reminders is now available at lotrointerface. Fixed a bug that caused an error message if you reordered the table columns (by dragging one of them) while a column was sorted. Added a convenient way to choose "now" (i.e. a delay of 0) in the expiration time dialog. You can now specify a different color for each tab, by right-clicking on the tab. Efficiency improvement. If you have a lot of reminders (i.e. hundreds or thousands), the plugin will now spread out the servicing work more evenly to avoid framerate hitching. Again with the excellent work. One small request and a question. Request: Could you make the minimized icon (R) so that it toggles with F12? Question: Is it possible to add an "on next login" timer? Yes, I'll add this in the next version. That's a good idea. I'll add it! Version 1.09 of Reminders is now available at lotrointerface. You can now specify the "server reset time" in your local timezone. Then you can conveniently choose that as the expiration time when you create reminders. There is a new option to automatically create reminders for "daily task" quests. If you enable this option, then the first time you turn in a "task" quest on a particular day, it will create a reminder for the next day at 3 AM server time. There is a new option to automatically create reminders for repeatable quests. If you enable this option, the plugin will keep track of all of the quests you complete; when you receive a quest that you've already completed, it will ask you if you want to create reminders automatically when you complete that quest in the future. The plugin now responds to the "Toggle HUD" hotkey (usually F12) by showing/hiding itself. Table rows now have tooltips, so you can see the data in narrow/hidden columns without having to resize/show them. There is a new (optional) table column: Location. You can save the location, for example, of a quest bestower. If you do so, and you have the Waypoint plugin, then when you move the mouse over the "Location" field, you will see a button that allows you to set the Waypoint target to that location. In the expiration time dialog, you can now specify "at next login", "at server reset time", or "never" for the time of a reminder, instead of a specific delay. All functionality is now supported in the German client, but I still need German translations for the user interface. Send me a PM if you would like to help. The behavior of the "postpone" button has changed. Instead of postponing a reminder for a certain amount of time, it postpones it until the character's next login. Last edited by Thurallor; Oct 01 2017 at 03:23 PM. Another idea: Would it be possible to add reminders for alts? Last edited by Urwendil; Oct 02 2017 at 11:48 PM. Of course, that's been one of the main ideas, from the beginning. Each reminder has a "Character" column indicating which character it's for. If you want to separate your reminders for different characters, you can make a tab for each character. For automatic reminders, you can specify what tab you want them to go under, for each character. and use Waypoint to guide you to all of the locations in sequence. Then go to your Reminders window, right-click on any Tab, and choose "Create Itinerary...". Paste this text into the window, and voilà. You can click on the calculator icon in the "Distance" column heading to calculate the distances from your current location. Then you can sort on that column to help plan your route. If you have the Waypoint plugin installed, you can click the arrow icon next to each location to set the target for Waypoint. Last edited by Thurallor; Sep 05 2018 at 02:42 PM. Version 1.10 of Reminders is now available at lotrointerface. In the previous version, sorting on the "Location" column didn't work (i.e. generated error messages). This is now fixed. Automatically create travel itineraries (described in the message immediately above this one). A new (optional) "Checkbox" column has been added. This just contains a checkbox for each reminder. You can use the checkbox however you want; its state will be saved, but otherwise it has no other effect. A new (optional) "Distance" column has been added. If you have a valid set of coordinates in the "Location" column, the plugin can now calculate the distance to those coordinates from your current location. To update the distances, click the target icon in the "Distance" column heading. 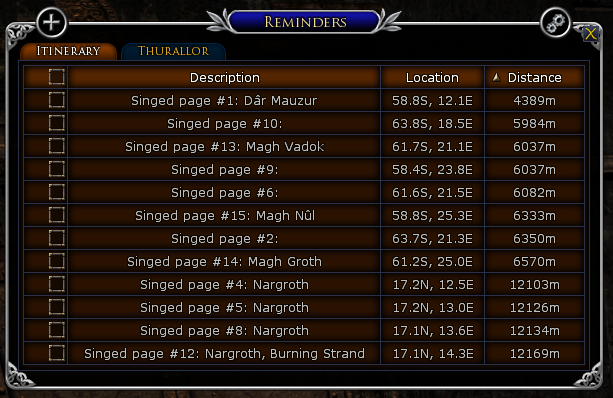 Version 1.13 of Reminders is now available at lotrointerface. In the previous version, I inadvertently left in some temporary debug code that interfered with sorting. This is now fixed. Fixed a number format conversion problem, manifesting only in the French and German clients, that caused error messages and prevented detecting the user's location and creating itineraries. Fixed a problem preventing some of the user's preferences from being saved (reported by Hornbarn). Received updated French translations from Gloradan. Improved detection of the Waypoint plugin. It no longer matters the order in which you load the two plugins. Last edited by Thurallor; Oct 06 2017 at 07:23 PM. Version 1.15 of Reminders is now available at lotrointerface. German translations have been added. Thanks, Glafria! In the previous version, the icon was always kept in front of the UI windows. This behavior is now optional. Expanded dropdowns can now be resized by dragging the corner. Thanks Thurallor for this wonderfull work!! Thanks for the Germand translations of Glafria as well. Version 1.20 of Reminders is now available at lotrointerface. New optional behavior: When a reminder is automatically created, the plugin can find an existing "expired" reminder of the same type, and "refresh" that reminder, instead of creating a new one. This should eliminate the need to manually delete expired automatic reminders. You can now double-click to rename a tab. Fixed a bug that sometimes caused checkboxes in the settings panel to forget their settings. Fixed a bug that could cause a single reminder to appear multiple times in the tooltip for the main icon, and improperly increment the number displayed there. Automatic reminders for "premium" ingredient crates should work now. The plugin will now deal gracefully with undocumented chat channels. The Escape and Enter keys now work to accept/cancel input in more places. Note: The Enter key will also activate the chat window; the Escape key will also close the currently active UI window or inventory bag, or open the System menu. There is apparently nothing a plugin can do to prevent this. The "rename" dialog will now open automatically when you create or clone a tab. Changed the icon and tooltip for calculating distances. Hopefully it will be less confusing. Updates to German (thanks: Glafria) and French (Gloradan) translations. Last edited by Thurallor; Oct 20 2017 at 04:52 PM. Version 1.21 of Reminders is now available at lotrointerface. You can now lock (write protect) a column, using the right-click menu of the heading. When a new itinerary is created, its "Location" column will now be locked by default. German client fix: The Gorgoroth Task quests are the first ones in the game that don't have the word "Auftrag" in their names. Added special handling code to recognize these quests as "Tasks". Now any quest whose name starts with "Eroberung von Gorgoroth:" will be considered a task. I hope there aren't any non-task quests with similar names. Just wanted to say "Thanks" for this plugin. It has been very helpful to me. I also am very appreciative of the time you are investing in it's development.